Papel Picado makes a colorful wall decoration for the back of your classroom. Keep your teaching aids in the front of the room. Your classroom walls are valuable teaching space - striking the right balance between decoration and teaching tools is crucial. I like to hang a combination of cultural items and teaching posters that help my students communicate. Most decorations should go in the back of the room while teaching aids should go in the front, the space that your students are actually viewing during class. My room has a back corner with a Guatemalan Huipil and carved masks. Since they are in the back of the room, they are one of the first things my students see when they enter class. It’s colorful, interesting and sets the stage for an cultural Spanish experience. The front of my room is reserved posters with question words, numbers, and Spanish mnemonics that I can easily point to during a lesson. If I can find a poster with cultural content that also demonstrates vocabulary or a grammatical structure, then I know I’ve hit the jackpot. Counting is one of the first things we teach our children! Why not do it in another language? I needed a nice set of posters for my beginning students to teach the Spanish numbers 1-10. I wanted a set of posters that was fun, functional and also highlighted Mexican culture. I made this set of posters for the classroom. With the big, bold words, students can easily reference the numbers in class. They have the added benefit of teaching the verb HAY (there is / there are) and a number of fun animals, colors, artifacts and places you may find in Mexico. When you are coming up to the Day of the Dead celebrations, it’s easy to find the Calavera masks and the papel picado on the posters. If you are talking about the Aztecs or Mayans, you can point out the pyramids. These are available in our store here. Fun grammar posters also have a place in the language classroom. Remember to put these in the front of the room where students can see them easily. 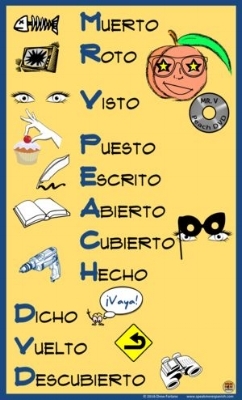 I hang my three page Mr. V. Peach DVD poster to remind my upper level students of the irregular participles when teaching the present and past perfect tenses. Who doesn’t love a puzzle? Done right, they are a great way to learn vocabulary and grammar. My older students are always willing to solve a good crossword or word search. “Crucigramas” and “sopas de letras” are easy to prep, fun to complete and provide another way for students to review vocabulary. Younger students love puzzles too! I teach my own daughters Spanish at home. This summer, I wanted to teach them basic high frequency verbs and structures they could use to speak in Spanish right away. I also needed something age appropriate that uses clear but fun pictures they could easily understand. These elementary level language puzzles were the key. 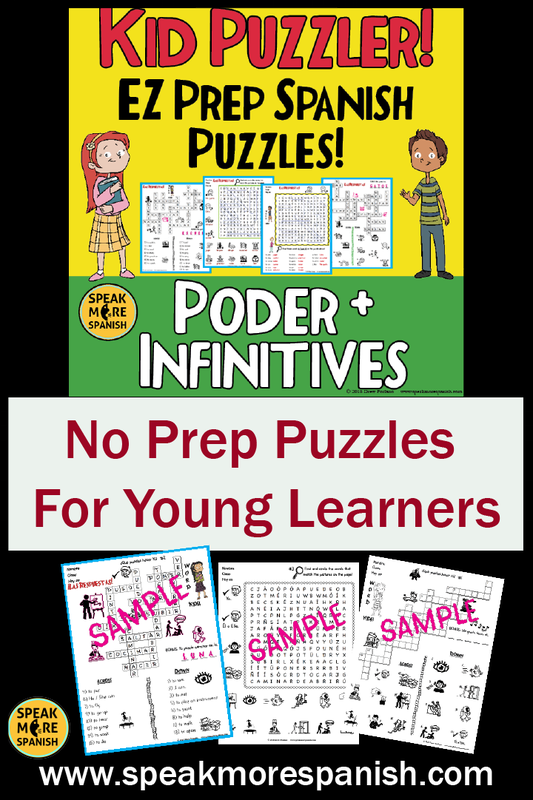 Here are my favorite ways to use these puzzles for elementary or middle school Spanish students. A PowerPoint slide highlighting gustar and nadar, and showing a Cenote in the Yucatán in Mexico. Introduce the vocabulary first with some fun visuals. I make Google Slides or Powerpoint presentations of the words. Use interesting photographs that incorporate culture when you can. For example, if you are teaching the structure “me gusta comer” then you may want to add in a fun photo of a gigantic Paella in Spain! Tell a short story with a couple of select pictures. Use the structures in the puzzles over and over. You can also do a Movietalk with any short clip or music video you find online. I love to use Pixar shorts and other readily available material on Youtube. You may be interested in our blog post about how to do movietalks which you can find by clicking here. Once students are familiar with the words, use the puzzles as either a group or individual activity. Picture crosswords have the added benefit of making students decipher meaning from the clues. I also differentiate in class by making word strips to use as extra clues for kids that need a little more help. Use a different version of the puzzle as review for another day, homework, or as a substitute lesson plan. Mix it up with a different format. I like to use crosswords first and then word searches as a review. Our elementary and middle school puzzles bundles have no prep worksheets that are print and play. With cut and paste activities, drawing, sorting and writing, they make learning fun for the youngest learners. I know my daughters love them! In short, have fun with puzzles and remember that kids just want to have fun! The Power of Drawing to Teach Spanish ¡A Dibujar! It’s simple to set up and requires little to no-prep. Every student is participating! It’s hard to do nothing if you’ve been asked to draw. Students demonstrate their understanding of the text, class discussion or video. It’s fun! Most kids like to draw! You can keep the drawings. Hang them in the classroom or post them on the board for discussion. Small student whiteboards are good to have on hand but if you don’t have any, plain paper will always work. Printable comic strip templates work great too. You can download a free set of ours at at our TpT store by clicking the image below. Keep a set of crayons or washable markers on hand to make the drawings more fun. Scene Drawing. Hand out student whiteboards or use plain paper. Students draw a scene from the book or text you are reading. When finished, have them discuss with a friend. Game Drawing. Using small white boards, line up students in pairs. Have one line of students with their back to the board at the front of the class. Project or hold up a word and tell the students that can see it to draw it for their partners. Tell the partners to guess what it is. They can ask yes and no questions too. This is great for speaking practice! Cartoon Strip Drawing. Hand out a simple cartoon template. Tell students to make a comic strip of a scene in a movie they just saw or from a book you are reading in class. Tell them to use speech bubbles. Once finished, have them pass their comic to another group. That group can then write down what is happening (present tense) or what happened (past tense) in the comic. All of our Cuéntame un Cuento lesson plans include two unique comic strip templates to retell the story they wrote. Drawing for assessments. 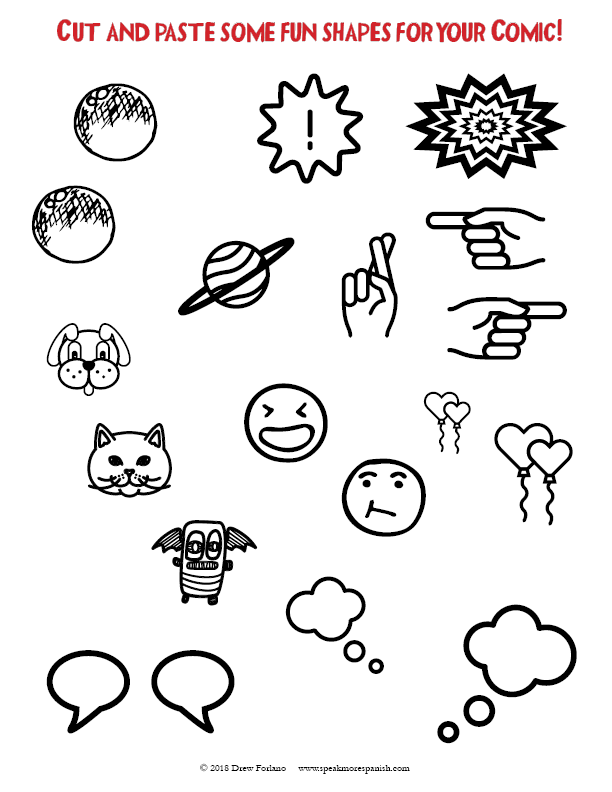 Use drawing on a quiz to show reading or vocabulary comprehension. I like to add a small Extra Credit question that includes drawing. I make it easy since my goal is to lower tension and add a little fun to the quiz. Here is a picture of one I recently included on a quiz about Kristy Placido’s TPRS book on Frida Kahlo. In this question, students had draw Frida Kahlo and Diego Rivera (they had already seen some photos of them together) and show their physical differences. They turned out to be super fun! Class Artists! In this activity, assign one or two students to be the artists for the activity. Then, ask and answer questions to the rest of the class to make up a crazy story that targets vocabulary or structures you want to cover. The artist students draw the ideas from the rest of the class. Follow up with students doing a retell by writing the complete story on their own paper or on the board. We have some FREE Comic Strip templates in our Teachers Pay Teachers Store. Get them here and try them out in class! These are just a few ways to add a little art to Spanish class! 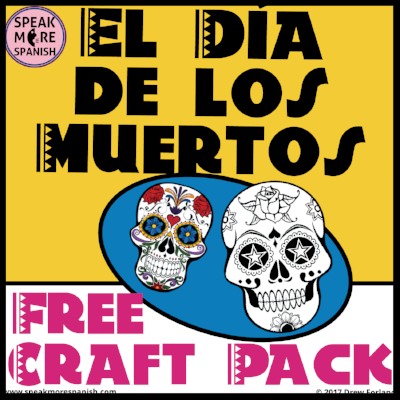 You may also like our previous blog post about our Day of the Dead drawing and craft activities. ¡Celebra el Día de Los Muertos! August 2018 Back to School Sale with TPT! Wow! It's hard to believe it's August already! If you are thinking about going back to school soon (or perhaps you already are!) 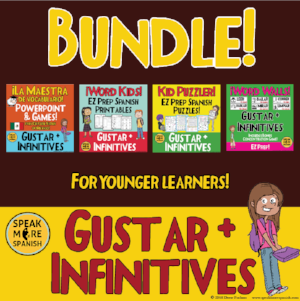 then don't miss the annual August TPT sale to stock up on some EZ Prep Spanish Lesson plans. All of our lesson plans will be 25% off during the two day sale, August 1st and August 2nd! Even our Bundles are on sale! Save yourself some prep time and add some fun to class to kick off the new school year! Just use the code BTSFRESH at checkout. Or Follow our Store here for future sales and freebies! While you are at it, why not sign up for our newsletter below?! Spanish task and pairing cards for teaching Spanish class. Pair work and communication activities for Spanish teachers. Printable Spanish worksheets and classwork. A FREE character analysis worksheet for using with El Internado to teach Spanish adjectives and simple verbs. FREE Games for the Holidays! 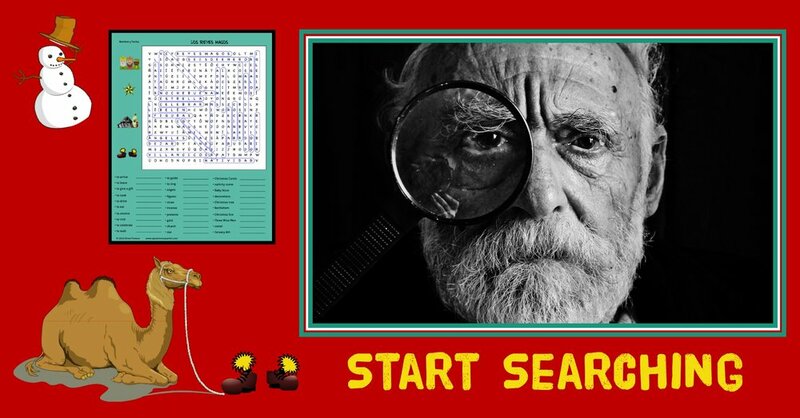 Games and puzzles are great vocabulary builders. Give your students a much needed break from the standard class exercises! This month we are celebrating the winter holidays with a FREE Multi-cultural Word Search you can download at our store. While you are there, you may also like our Winter Bundle of vocabulary activities and fun for the Spanish classroom. Oh yeah, scroll to the bottom of the page and sign up for our newsletter for even more fun! ACTFL is the national language teachers' conference. This year it's in Nashville, TN. It's one of my favorite times of the year. Where else can you geek out with 12,000 other language teachers for three days? If you couldn't make it this year, check back here to find out what's going on! We'll be blogging about the conference all weekend. Plus, sign up for our newsletter for more Spanish fun! Let us know if you are at ACTFL this year! Read more here. Music City Center. Nashville, TN. ACTFL 2017! El Día de Los Muertos is hands down one of the best holidays to teach in Spanish class. I love highlighting the mixture of cultures, the art, music and food of Day of the Dead. It's worth the time to take a break and celebrate the holiday by decorating your classroom with some Mexican themed art. Try these craft packs below which are designed to be flexible to allow for student choice. Your students can make banners, masks, paddles or drawings with the different size templates. These are loads of fun, even more so if you play some Mariachi music while creating your art! Download the free sample version below! Download the Free Sample Pack Now!